Check out this sweet Hot Wheels mirror. All the information that you need to make one is in the graphic below. 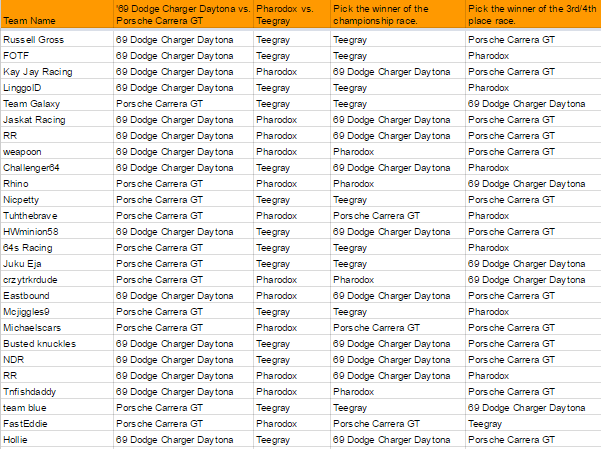 Welcome to Season 2 of the Hot Wheels Fantasy Pick'em game. 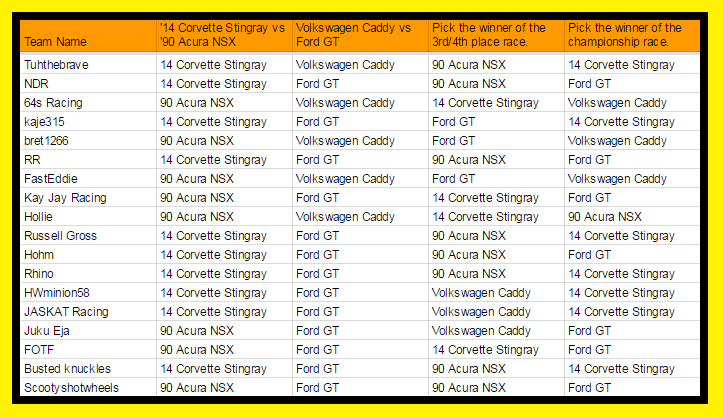 Each week we race 4 new cars and you have the chance to pick who you think will win. Make your picks, score points, and most of all, have fun! Here is the week 3 line-up. You can join in at anytime, so even if you haven't picked in previous weeks, make your picks and have some fun. This weeks picks have been posted above. If you've forgotten who you've picked, take a look above, then sit back, click play, and cheer on your cars! Team standing are updated. You can check them out HERE. Then make your picks for week 4 HERE. In 2015 I raced quite a few cars to see which one was the fastest. The track used was the King of the Hill track. It is a 2 lane track and is 14.5 feet long. It has a 24" high drop that is 4 feet long. It has a an electronic finish line with a timer so to find the fastest car I could compare the times. The track was permanently set up so the track never changed and the cars were always raced in the same lane to help ensure that they all raced under the same conditions. One thing to consider as you look at the results is to remember that each individual car is different. Meaning that you could have two of the exact same car, and one will be faster than the other. That is kind of the fun thing about racing, is trying to find that really fast one. It's almost like trying to find that Super Treasure Hunt for collectors. That being said, there are certain castings that generally are faster than other castings. To really establish that scientifically, I should probably get 5 or 6 of each casting and then race them all and give them average times, but that is just not financially feasible for me. 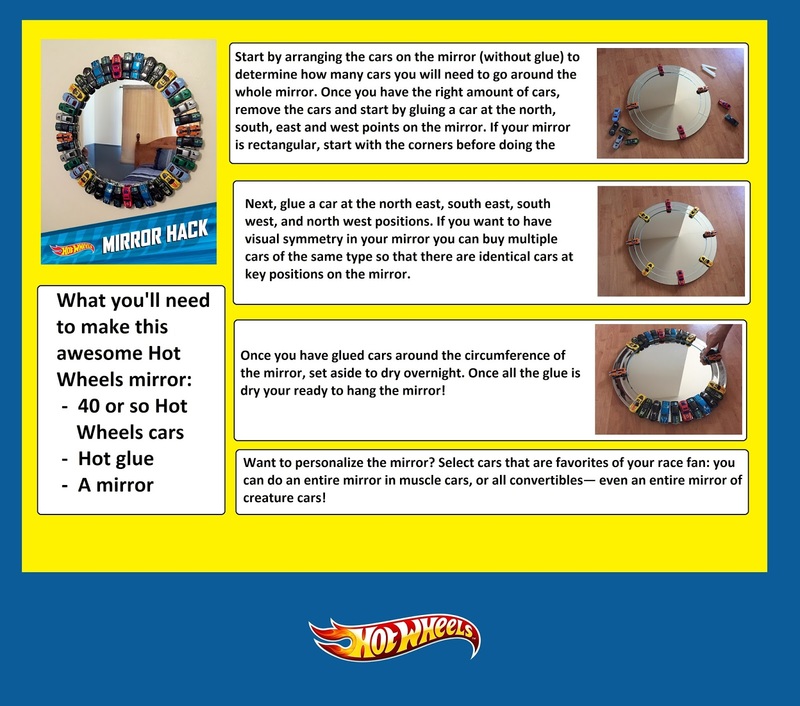 So, take these findings with a grain of salt, but hopefully they will lead you in the right direction as to some fast Hot Wheels cars. The Corvett Grand Sport Roadster weighs 35 grams. It was the fastest car that I tested from the 2015 mainline. I am confident that this is a fast casting and not that it just happened to be a fast car. I had a few of these castings and they were all fast. This casting has also performed well in my 2016 Fastest Hot Wheels car tests. In real life, the Bentley Continental Supersports is a lightweight version of the Continental GT. It was once the fastest Bentley ever made, with a top speed of 204 mph. It lived up to it's pedigree in the Hot Wheels version as well, being the second fastest car I tested. The Bentley weighs in at 36 grams. I don't know if this was just a fast car or if the casting is fast as well. I never did get another of these to test out. We will be testing out the 2016 version in a few weeks though, so I'm interested to see how it performs. The 2015 version weighs in at 35 grams. It was the third fastest car I tested. Pharodox definitely has potential to be a fast car with those big wheels in the back and low profile, but other versions of this car have not performed as well for me, for example it's 2016 showing. In my gut, I feel like I just got lucky with this particular car and it over-performed. However, this casting in general could still easily be in the top ten. The Honda civic finished in fourth place in my tests. I feel pretty confident in this car making the top ten. I did race any more of this casting, but I have heard from multiple sources that their 90 Honda Civic EF's were fast as well. RD-03 made a good showing and rounded out the top five fastest Hot Wheels cars of 2015. It finished just a hair behind the Civic...literally. If you look at the times, you'll notice that it was just 2 ten-thousandths behind. Side by side that is almost impossible for the naked eye to distinguish at the end of a race. 1971 Buick Riviera finished 6th in my testing. It definitely has potential to be a fast car as it is a bit heavier than some of the other car on this list, coming in at 40 grams, as well as a bit longer. Length usually translates into a higher center of gravity in the starting gate which means a bit more potential energy. Hot Wheels began producing the Cockney Cab II in 2005. The 2015 version weighs in at 38 grams.That was good enough for the 7th fastest Hot Wheels car from my 2015 testing. I did get to race a few others of this same casting and this particular car seemed to be consistent with the other Cockney Cabs that I tried. Battle Spec is a car from the animated Hot Wheels Acceleracers movies. The Hot Wheels version of Battle Spec weighs 36 grams. It finished eighth in my 2015 speed tests. I only bought one of these cars so I don't know if this is par for this casting, or if it is and under or over-achievement. Rrroadster was one of the lightest cars to make the top ten, weighing only 29 grams. It finished in 9th place. Rrroadster may look familiar, as it is the preview design of another Hot wheels car, Fast Felion. The Ford Shelby GR-1 Concept first came on the Hot Wheels scene in 2005. It's been in production since then and the 2015 version weighs in at 33 grams. It rounds out the top ten fastest Hot Wheels cars of 2015, finishing in tenth place. Well, there you have it, the top ten fastest Hot Wheels cars from 2015. One observation that I might make is that the top two cars were quite a bit faster than the rest. Both of them were in the 1.84s while the rest of the top ten were in the 1.87s to 1.89s. About .02 seconds separated the last 8 cars, but .03 seconds separated the first 2 cars from the last 8 cars. What did you find? What were you're fastest cars from 2015? Let us know in the comments below! 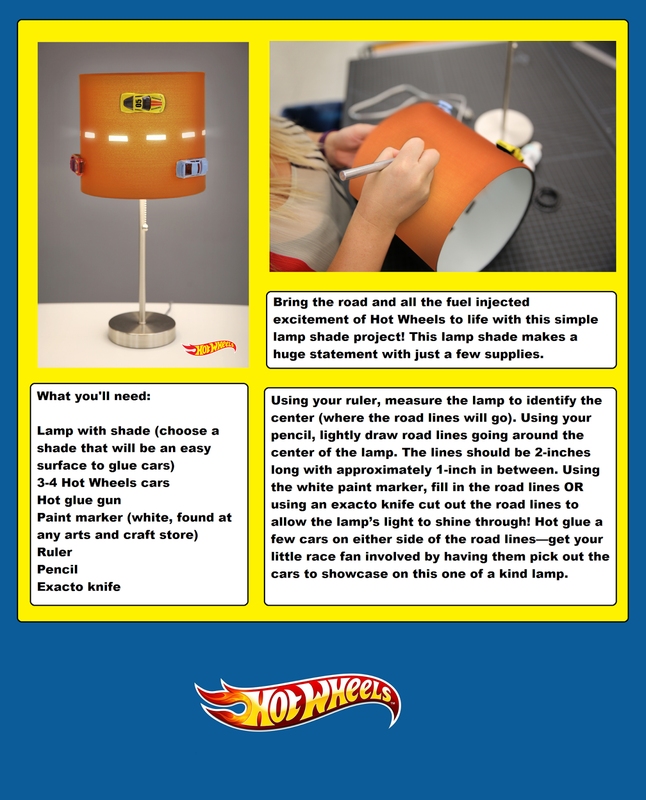 Check out this super cool Hot Wheels lamp! Learn how to make it in the graphic below. Points are totaled after each week. Points double after each round. In round 1 a correct pick is worth 1 point. In round 2 a correct pick is worth 2 points. In week one, there were two possible picks in round 1 and one possible pick in round 2 for a total of three pick and 4 points. In subsequent weeks, the 3rd/4th place race will also be picked giving a possible of 2 picks for each round and a total of 6 points possible. The second season of the Hot Wheels Fantasy Pick'em Game is underway! Here is the line-up for races in week 2. You can join in at anytime, so even if you haven't picked in previous weeks, make your picks and have some fun. This weeks picks have been posted above. If you've forgotten who you've picked, take a look above, then sit back, click play, and cheer on your cars! Check out the updated Team standings HERE. You can make your picks for week 3 HERE. Some interesting races this week. After the first two races it looked like we were going to have a close second round, but soon after the first race was started, it was obvious that the Firebird/Muscle Speeder race was much faster than the Power Surge/Vandetta race as the Firebird easily cruised to victory. Seeing the results of that race, it was easy to predict what the results of the Muscle Speeder/Vandetta race would be. 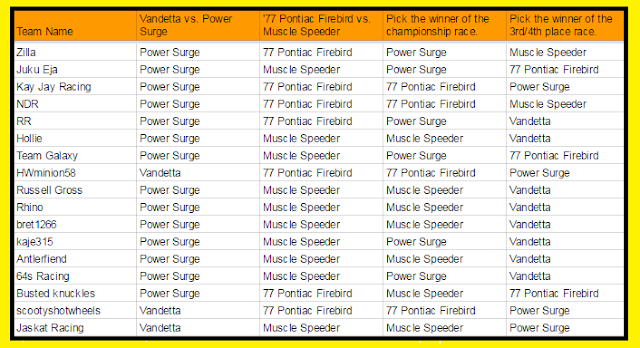 Even though Power Surge was second on the podium, it is clear from how close the Firebird/Muscle Speeder race was that Muscle Speeder was clearly the second fastest car, but that's how the matchups played out. Welcome back to Hot Wheels Pick'em. This is the first week of our new 8 week season. We'll be racing 4 new 2016 mainline cars this week. We will continue to race 4 new cars each week for the next 8 weeks and then race each week's winners in a final championship bracket. Each week there are a possible 6 points up for grabs. One point for each first round winner that you pick and 2 points for picking the finals winner and 2 points for picking the winner of the 3rd/4th place race. Results an video of the races will be posted at the end of the week. Hope you have fun this season! Let's get to it. Here are the cars for this week's line-up. This weeks picks have been posted above. If you've forgotten who you've picked, take a look above, then sit back, click play, and cheer on your cars! Check out the team standings HERE and then make your picks for week 2 HERE. Some great racing this week with the final coming down to the wire! The Porsche and Teegray were neck and neck as they approached the finish line. It's a good thing I have an electronic finish line. It was to close to call with the naked eye.